I am proud to be an American, when this is considered a sport. Some new rules in the NFL. 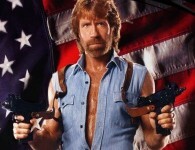 Contrary to popular belief, Chuck Norris was dropped at Hiroshima and Nagasaki..